A few weeks ago something momentous happened in our household: Ryan finished his MBA [Master’s in Business Administration]. This was something he’d been working on for the last three years—working all day in his fulltime job and then heading to class a few nights a week. It is an accomplishment we are thrilled he achieved, but I’ve even more thrilled to have him back. Although I always found plenty to keep busy with on my evenings along (namely, my own Master’s degree and this blog), it’s going to be awesome to have him around—and without the stress of schoolwork hanging over his head! One of the things I missed most was cooking and eating together. Although I was perfectly content in the kitchen by myself, it became a tiresome, rushed affair. We’d burst into the door from work and I’d immediately start working on dinner, sometimes before removing my coat. I’d quickly plate his dinner and he’d eat in the office while doing last minute homework or (most likely) catching up on sports news. He’d then rush out the door and I’d settle in for eating my own dinner before working on the dishes. That jig is hopefully a thing of the past! We spent one of our first “post-degree” evenings putting this meal together. It wasn’t anything fancy, but having a partner in the kitchen made it infinitely more enjoyable. 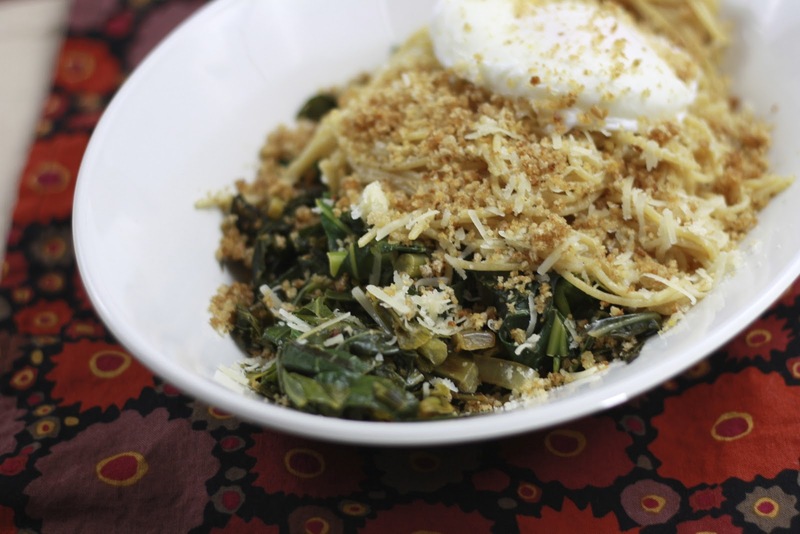 Ryan chopped greens and poached eggs; I toasted breadcrumbs and shredded cheese. Our team effort paid off and dinner came together effortlessly and flawlessly. The ingredients are basic, but the simplicity of this dish is precisely what made it so good. 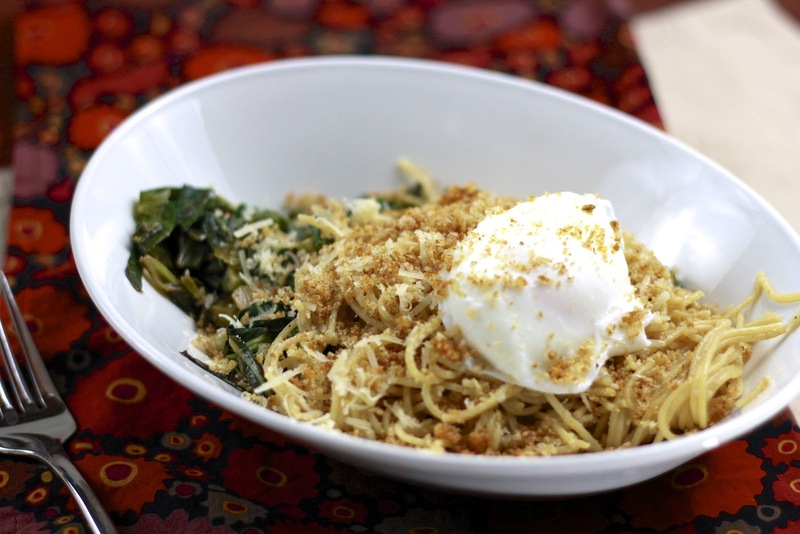 Minimal ingredients allow the tastes to stand out—tender greens mixed with toasted breadcrumbs and salty Parmesan all encased in a runny egg yolk. It was nothing fancy and yet, shared with Ryan at the table. together. it was just perfect! 1. Preheat oven to 400F. Pulse bread in a food processor to form breadcrumbs. Toss crumbs with 2 tsp olive oil and place on a baking sheet. Bake for 8 minutes, stirring occasionally, until toasted. 2. Heat a large nonstick skillet over medium-high heat. Add 1 tsp oil and swirl to coat the pan. Add the sliced onion and saute until golden, stirring frequently. Gradually add the greens, stirring to wilt after each addition. Add 1/2 cup water, red pepper, and garlic. Reduce heat to medium and cook, uncovered, until greens are tender (about 12 minutes), stirring occasionally. Stir in 1/4 tsp salt. Keep warm. 3. Bring a large pot of water with 2 tsp of salt to a simmer. Work with one egg at a time. Crack each egg and gently slide egg into the water. Cook for 3 minutes, just until whites are set. Use a slotted spoon to carefully remove egg (remove any remaining egg solids as well). 4. Bring pot of water to a boil. Add pasta and cook for 10 minutes, until al dente. Drain pasta and place it in a long bowl. Add 1 oz cheese, remaining 1 tbsp of oil, and black pepper. Toss to coat. 5. Divide greens among bowls. Top with 1 cup of the pasta, 1 egg, and 1/4 cup breadcrumbs. Sprinkle with remaining cheese.